The REDvolution takes priority, but those lesser sports need an occasional mention. For a state that’s made a foray into the wonderful world of professional hockey and is trying to make serious inroads into taking it to the next level, the state of Florida is coming up pretty short during the 2016-17 season. I mused over this while attending my younger son’s youth hockey practice on Sunday. Puck is growing in South Florida, and from my time over in Estero watching the Florida Everblades of the East Coast Hockey League (worth a visit, by the way; they’re the best pro team in the state at 19-4-3-7), youth hockey is prospering. Thankfully, hockey growth in Florida this season isn’t reliant solely on the on-ice play of the Tampa Bay Lightning and Florida Panthers. Both are mired in mediocre seasons, especially when expectation are considered. The Bolts (19-19-4) were a preseason favorite by most to win the Eastern Conference and even by some to win the Stanley Cup, but they actually grid sixth in the Atlantic Division, tied with Florida with 42 points but behind on games played. The media didn’t have such lofty expectations of the Cats (17-16-8), but most figured they would still be skating in the postseason. With multiple acquisitions and the “core lock-up” in the offseason, most everyone, myself included, felt the organization would be painting “Stanley Cup Playoffs” on the ice. Right now, both aren’t far out of a playoff spot in the Atlantic — two points, in fact — and there’s always hope, I guess. Yet neither club has shown signs of life as the year turned, and if you’re smart you wouldn’t bet on either to set a playoff roster in three months. Tampa is without star Steven Stamkos and No. 1 goalie Ben Bishop, whom they surely will lose as a UFA-to-be in the offseason. Currently, the have lost four straight in regulation to open 2017 and have been outscored 22-9. Scoring hasn’t been a problem for Tampa, ranked 13th in goals per game, but stopping the puck has been an issue. Andrei Vasilevskiy, the 22-year-old future No. 1, hasn’t been able to defend anything lately and might not be a favorite to stop one of those red multi-purpose balls we used on the playground when I dominated kickball in third grade. Worse still is that I’ve run across some Bolts fan who are so upset with the way coach Jon Cooper has handled the Vasilevskiy situation, mainly because of not yanking him at some point in favor of rookie Adam Wilcox, that they’ve gone as far as to want general manager Steve Yzerman to fire Cooper. That would be a colossal mistake, an error so enormous and destructive, like an insect exposed to radiation in a 1950s B horror movie, that someone would have to step in and act. It was the military in those movies, and we do have Vinnie Viola overseeing the Army now, but it would have to be Cats’ management that stepped in to save the day. That would mean hiring Cooper. Immediately. The next day. Don’t wait around. Everyone has been so caught up in Florida’s drama that any talk of next season’s coach has not begun. If Cooper were available, he would have to top the list. He produces offense and runs a good system. He generally wins as well, plus he certainly knows the conference inside and out. Tampa has more problems that that, though. The salary cap is always a dicey issue, and Jonathan Drouin, Tyler Johnson, Ondrej Palat, Andrej Sustr and Nikita Nesterov are all RFAs next year, which will force more payroll finagling by Yzerman. Drouin or Johnson would be great additions to Florida’s offense, though it would have to be at the expense of offer-sheeting, which doesn’t happen hardly at all. As for the Cats, they have failed from the get-go in a season that saw top left winger Jonathan Huberdeau injured indefinitely and Gerard Gallant axed — and it didn’t get much better from there. Now half of the lineup interim coach Tom Rowe ices each night is borderline AHLish. Huberdeau, Aleksander Barkov and Nick Bjugstad have all missed significant playing time with injuries, which is a ton of scoring and productivity to try and replace. I know it’s little consolation, especially if you shelled out big bucks for season tickets or are just a Cats fans who suffers at home every time they blow a late lead, but the Panthers aren’t wallowing in their mediocrity alone in the Sunshine State. They should pay close attention to what’s going on up Interstate 75. 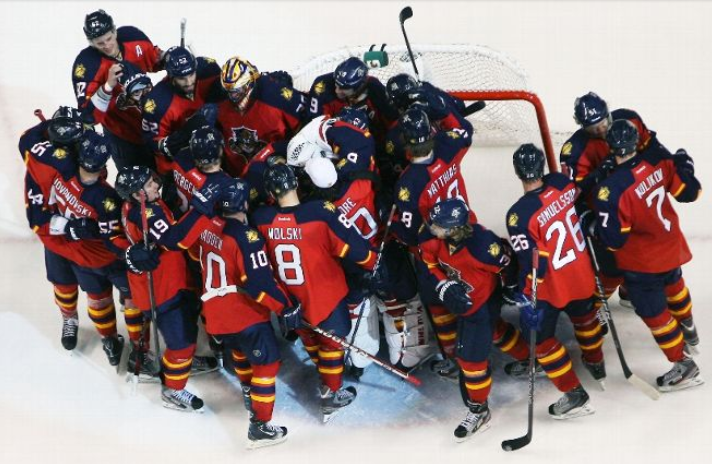 Florida Panthers coach Tom Rowe has an easy job on his hands today: Getting his Cats, who are all over the place with their lines, ready to face a losing Winnipeg Jets team that has already beaten the Panthers. Last month they lost to Winnipeg, a club that currently grids out as 25th in the NHL in the conference standings. That should be enough motivation right there for professional athletes: Losing to a bad team. A bad team with a good coach and skilled players, but a bad team nonetheless, especially on the back end. If Florida isn’t ready to play tonight and comes out sloppy, it will be on everyone — Rowe, his staff and the rest of the staff. Everyone. Florida has been off since Saturday’s solid effort against Dallas, and the approach they took against the Stars is the same one that needs to apply tonight. Shoot the puck. Every time it’s on your stick, send the frozen rubber toward either Michael Hutchinson (4-7-2, 3.18, .894) or Connor Hellebuyck (14-12-1, 2.76, .908). The latter played adequately in a 6-4 win over Tampa, allowing a pair of late power-play goals to tighten the game. Florida (16-14-8) lost 4-3 to the Jets in December in Manitoba in a game when Aleksander Barkov, Vincent Trocheck and Reilly Smith scored power-play goals but couldn’t capitalize and earn two points against Winnipeg and Hellebuyck. Florida put 44 shots on Hellebuyck in their previous meeting and outshot Dallas 22-6 after one period on Saturday. Forty shots on goal should be the benchmark for the Cats, especially against Winnipeg’s shaky netminding. While we’re at it, let’s end the night with SOGs being in the mid 40s. The worst tact Florida could take is underestimate the Jets (18-19-3), which might be a possibility considering Winnipeg played a fast-paced game versus the Bolts last night. There was almost no neutral zone play as forwards streaked through center ice unimpeded. Florida must slow down speedy, talented forwards Patrik Laine, Blake Wheeler, Nicolaj Ehlers and Mark Scheifele to take some of the pressure off Roberto Luongo. Like Florida, the Jets are underachieving as well. The Panthers are four points out of third in the Atlantic Division with a Saturday meeting with Boston lying in wait, while the Jets are three points out of a wildcard spot. No doubt, both face huge uphill battles of making the postseason, but Florida needs to take care of the business in front of them of beating the Jets instead of thinking about what lies ahead. Then they can worry about Nashville, who will also be playing Tampa the night before they meet the Cats on Friday. Well rested and coming off a sweet road win in a game where they attacked the Stars early, there’s no reason at all the Panthers should have jet lag against Winnipeg tonight and stink up the joint.